Todays project is for the challenge over at DT Cookie. Be sure to stop by and see what the talented DT has for your creative inspiration and enter for a chance to win some digital images. October is breast cancer awareness month. Did you get your mammogram yet. The latest recommended ages start at 40 years of age once a year. After 55 years of age get exam every 2 years. Of course if there is a history of breast cancer start early as of age 20. Best of all do self breast exams often. For today's project the image and sentiment is from A Day for Daisies. I used the Silhouette Cameo to cut the butterfly and Spectrum Noir markers to color it. 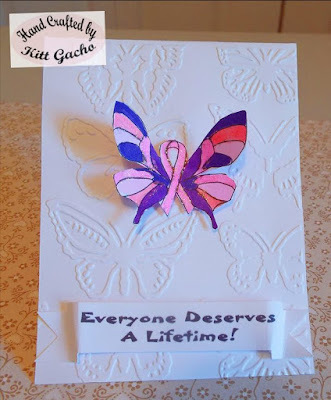 I also used Memory Keepers butterfly embossing folder on the base of the card. Thanks for stopping by today and leaving your comments. I look forward to hearing from you. Have a happy crafty day.